Description: CSX train Q-572-09 has just departed CSX Gentilly Yard and is heading east, timetable north, on the CSX NO&M Subdivision seen here approaching the Old Gentilly Road crossing. Three SD40-2's power this train: UP 3576, NS 1636, and NS 6081. 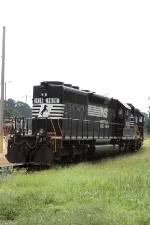 Description: NS #G28 is sporting a typical older EMD consist at Montezuma, GA. Description: NS G91 power is seen easing into the fading sun at Hilton GA. Description: 321 passes a train off the "B" line.